Custom made ring is created in Continuum Sterling Silver. 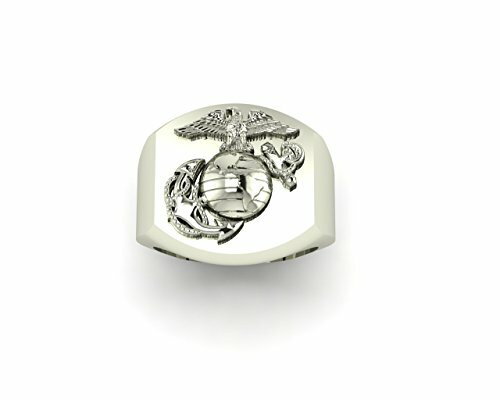 Large Solid Man's Marine Corps Ring - exceptional detail, design for those who enjoy large Rings - 18mm (.70inch) from top of ring to bottom on the face of the ring, with a 16mm Eagle Globe and Anchor. Tthe back side of this ring is solid. The entire ring is polished, if you select Antique finish, the lines of the globe and other parts of the Eagle Globe and Anchor will have black applied to make it stand out more. Each ring is custom made to order and will take between 2-4 weeks for delivery. If you have any questions about this product by Marine Corps Rings, contact us by completing and submitting the form below. If you are looking for a specif part number, please include it with your message.